State Department Defends America's Image Abroad Every morning, a group meets inside the U.S. State Department to come up with ways to respond to media around the world. The people in this room are just one part of an effort to repair a major problem: the declining image of the United States overseas. Every morning, a group meets inside the U.S. State Department to come up with ways to respond to media around the world. The people in this room are just one part of an effort to repair a major problem: the declining image of the United States overseas. 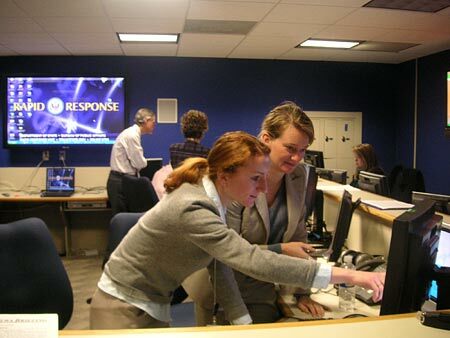 Elizabeth Cavness, left and Susan Corke at the State Department's new rapid response center. Here are some of the headlines from Iraq, as they appear in America and as they appear overseas. A car bomb struck a military base in Northern Iraq today, killing dozens of Iraqis. It happened on the same day that people were burying the dead from yesterday's violence. Scores of people were reported killed yesterday. In one incident, Iraqi police say the United States was involved in a raid on a mosque. The Iraqi police say that raid led to the deaths of nearly two dozen Shiite militia men. MONTAGNE: The U.S. Military is telling a different story. Americans say that Iraqi forces, with American support, struck a meeting hall and freed a hostage. INSKEEP: Those conflicting reports mean it is probably a busy morning inside a room at the United States State Department. Last week, a phone call arrived in that room here in Washington. Unidentified Man #1: Hey, how you doing? INSKEEP: The call came from Baghdad, where the caller was tracking a news story. Unidentified Man #1: Is it playing in the Iraqi media, local media at all? Unidentified Man #2: Yeah, it's starting to, certainly on the satellite channels. INSKEEP: From an American point of view, the news was not good. Unidentified Man #2: And of course it's quite grizzly. INSKEEP: Arab television showed images of blood and body bags, Iraqi civilians allegedly killed by Americans. Unidentified Man #2: You know, it looks bad and it's being portrayed in a fairly grizzly manner. I'm not sure where some of this video footage is coming from. INSKEEP: We heard that call inside the State Department's new Rapid Response Center. The people inside this room are just one part of an effort to repair a major problem: the declining image of the United States overseas. Unidentified Man #1: Thanks for the report. Unidentified Man #2: Now, there's also, you know, third anniversary negative commentary coming in. I mean some of it is not bad. INSKEEP: We came here to get a better view of how the world sees us and what the government is doing about it. The speaker phone is surrounded by a handful of people who speak Arabic and other languages. They in turn are surrounded by computers and giant flat-screen TVs showing the Arabic channels Al-Jazeera and Al-Arabia. Mr. ADAM ERELI (State Department): This is all stuff you don't see on the U.S. television. This is what Arabs are seeing. INSKEEP: One particular story that Arabs are seeing is of special interest to the State Department's Adam Ereli. It started last November; that's when the U.S. said a roadside bomb killed civilians in Haditha, Iraq. Then, last week, Time magazine reported the civilians were really killed by American troops seeking revenge for the roadside bomb. The allegations got limited attention in the U.S. media. But the monitors here in the Rapid Response Center show that video of the bodies is now displayed on Al-Arabia. Mr. ERELI: There are two aspects to this whole process. One is, what are the problems that we have to deal with? The second is, what do we say? You know, what's our message? INSKEEP: Which is what the people in the room at the State Department begin to hash out; half a dozen people crowd around a computer screen. Unidentified Man #3: We've got more messages than this, don't we? Unidentified Man #4: Yeah, right. Unidentified Man #4: Yeah, yeah, yeah. Unidentified Man #4: Can we say we don't target civilians? Unidentified Man #5: And we can say that too. INSKEEP: If this sounds a little like the war room in a presidential campaign, that may be no accident. The center was started by Karen Hughes, the former communications advisor to President Bush. Now she's the new top State Department official for what's called public diplomacy. Unidentified Man #6: We do not target civilians. Any loss of civilian life is regrettable. INSKEEP: She assigned a career diplomat named Duncan MacInnes to set up this office, sending information to top officials and to every U.S. embassy around the world. Mr. Duncan MacInnes (Organizer, Rapid Response Center, State Department): The ambassador, for instance, in Cairo, now has something. He's aware of this when he goes out today. Then he talks to Egyptians, publicly and otherwise. He can actually say, let me reiterate that we, you know, we don't target civilians, blah, blah, blah. INSKEEP: And might the ambassador in Cairo then be getting back to you through his staff by tomorrow to say what you gave me to say was useless? INSKEEP: ... for the anger over this? Mr. MacINNES: They will say that. We had a problem when we had the secret prisons in Europe. INSKEEP: At first, the State Department had almost nothing to say about a Washington Post story that the U.S. was holding detainees overseas. On this story, the department again has limited information about how civilians were really killed in Haditha, Iraq. So as Duncan MacInnes types, a colleague hands him a printout of words that were used after another story. Mr. MacINNES: Oh, here we go. That's good, I like it! I like it! Loss of any innocent life is a tragedy. INSKEEP: This is not the first U.S. effort to burnish its image abroad. It is the government's latest effort to communicate with itself to get timely information to officials around the world. Mr. JOHN BROWN (Employee, State Department): It's an enormous problem. The government often does, the right hand doesn't know what the right hand is doing. INSKEEP: That's John Brown, a longtime employee of the State Department and before that the U.S. Information Agency. He resigned in protest before the war in Iraq. Now he runs a blog that collects news on public diplomacy. Brown is one of several experts outside and inside the government who say a rapid response is only one small part of improving the nation's image. Mr. BROWN. This is intensely personal work. It's not sending emails to Washington all day. It's going out there and getting to know the people who matter in a certain society. INSKEEP: Is there a connection between those years of work seeding a country and the way that people finally listen to the United States when there's a controversy and the U.S. is trying to get its side of the story out? Mr. BROWN: Well, I think that if, you know, the information section of an embassy has done its job properly, people will be much more willing to listen to the United States, even if the message is not particularly to their liking, if in fact the groundwork as been laid. INSKEEP: The Bush Administration is pledging to shift resources to key nations, everything from diplomats to scholarships. Anything to increase U.S. connections with increasingly hostile places. In the rapid response room, Duncan MacInnis says that kind of contact is needed. Mr. MacINNIS (Rapid Response, State Department): It's the old thing of have you stopped beating your wife, you know? There's no answer to that question because you're already put into frame. If you get out early you can set the frame, something as simple as environmental issues. The U.S. is always put in the frame of anti-Kyoto. The anti-Kyoto frame says, without even knowing what the story is, the anti-Kyoto frame is the U.S. is a big polluter that doesn't care about the environment. Iraq is a negative story frame. Everything that's put in that frame tends to be negative, and certainly an atrocity story, no matter what you do, is a negative frame. Mr. MacINNIS: Oh yes! Yes, that's actually appeared in the Turkish press. INSKEEP: When you think about the job that you do here, are you sometimes tempted toward clichés like finger in the dyke, rearranging deck chairs? Mr. MacINNIS: No, because I view it more as a challenge for us to come up with new ways of doing things. INSKEEP: By about 7:30 in the morning Washington time, people in this room send out a daily summary of key stories, along with suggestions on what to say about them. Unidentified Woman #2: I think now we're in a phase where we have ambassadors, cabinet officials, who need less detail rather than more. INSKEEP: The group hammers out the best statement it can about the Iraqis killed in Hadifa. Unidentified Woman #2: We do not target civilians. I think that's a pretty simple message. An ambassador will get that. INSKEEP: Later, the State Department's Duncan McGinnis gives us one more look at what his team is up against. Mr. MacINNIS: This was actually a broadcast at 10:02 GMT this morning. INSKEEP: A member of his group consults a computer database and calls up the images of civilian casualties as broadcast on Arab television. INSKEEP: ...it's pretty powerful video. Blood everywhere, body bags. Mr. MacINNIS: One of the things we're working on, trying to get a handle on, is images. You know that if you show an image and the text is totally opposite, people remember the image, not the text. You can show an American soldier building a school in Iraq, but what an Arab might see is an American soldier occupying an Arab country. Even though it's doing good things. And so the image is often more powerful than the message. INSKEEP: That's just some of what's happening out of sight to many Americans, developments that U.S. officials are straining to understand. And contain. Tomorrow we'll talk to Karen Hughes, the Presidential Advisor in charge of selling the United States abroad. Unidentified Man #9: Yes. Yeah. Mr. MacINNIS: Has that been picked up at all? We saw it in Knight Ridder. Unidentified Man #9: Yeah, that's out there as, it's the secret unit out of, you know, out by the airbase, for the interrogations. Unidentified Man #9: So all of these things are percolating at the moment.